When learning English, students are usually given a list of irregular verbs to memorize. This list usually consists of 60 to 100 verbs. There is nothing wrong with this approach but I think that it would be much more useful to give students a list of the most frequent verbs in English and the chunks the verbs appear most often in. Unfortunately, there is little material like this. That was why I tried to create some. In this post, you will find a worksheet which contains nine most frequent irregular verbs in English. 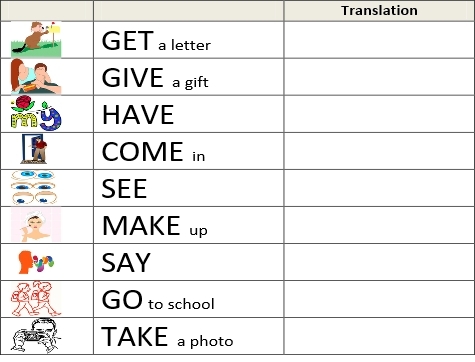 Moreover, the verbs are practiced in the phrases they appear most frequently in. At the end, students are given a chance to memorize these really useful chunks and use the irregular verbs in exactly the same way the native speakers do. 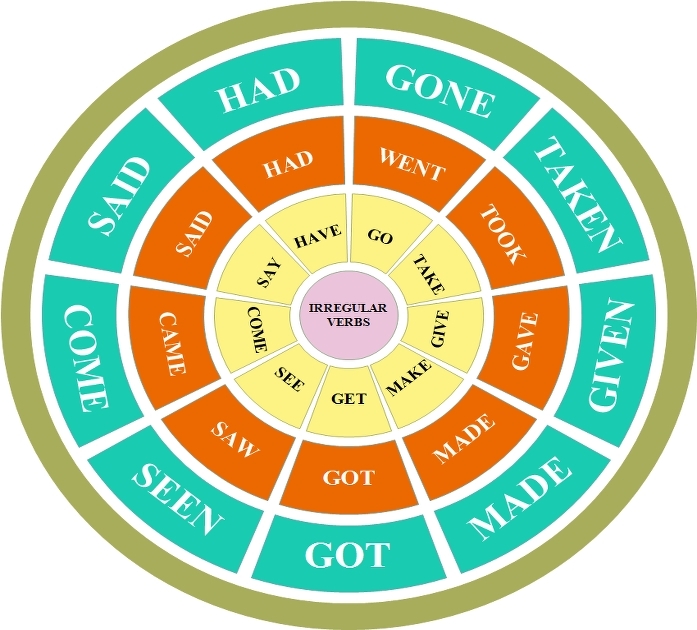 Do you know which irregular verbs are the most frequent in English? They are: be, have, say, make, go, take, come, see, know, get and give. It is important to understand the verbs. I suggest that the students should translate the verbs into their mother tongue. For this, there is the following table with several pictures. The pictures demonstrate the meaning (or better to say one of the meanings) of the given verb. Once the students translate the verbs, it is a good idea to cover the verbs and try to remember them using only the pictures. Moreover, now it is the right time to memorize all the 9 verbs and their forms. Once the students learn the irregular verbs, it is necessary to practise them. Use the second page of the worksheet and in the exercise 1 students try to fill in the gaps using the correct form of the verbs. At the end of 1980s Michael Lewis suggested that we should teach chunks of language. Popular as the notion might be, there are very few materials that would promote this kind of teaching. In this worksheet you will find a table with the most common collocations of the irregular verbs. This list is based on my research in BNC corpus. I suggest that students should learn the phrases by heart. I hope you find this post and worksheet useful.